Babka, which literally means "grandmother" in Polish, probably got the name because its shape is reminiscent of an old woman's wide, swirling skirts. Babka is a slightly sweet yeast bread similar to Italian panettone that can be made with rum-soaked raisins or other dried fruit, and iced or left plain. It's an Easter favorite among Poles and Ukrainians, and year-round by Ashkenazi Jews. As one might imagine, the varieties differ by region and by country. This babka cake is a light pound cake soaked with rum syrup after it is baked and cooled. 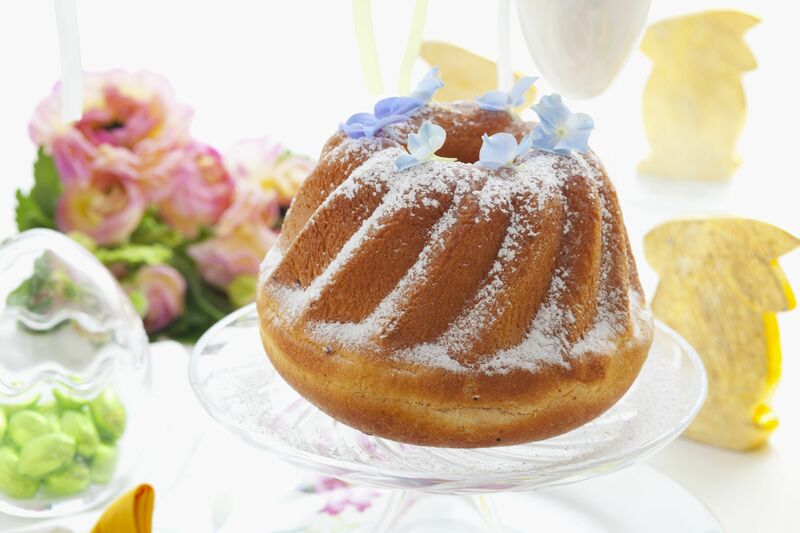 You can dust the cake with confectioners' sugar but that's a bit like gilding the lily. Place on a serving plate and surround with colorful jelly beans or decorations of choice. This Polish Easter babka celebrates the return of egg and butter to the diet after the Lenten fast. A mere 15 egg yolks are featured in this traditional recipe! Half bread and half cake, a babka is an indispensable component of a Polish Easter feast and is featured in other cuisines, including Ukrainian where it takes a tall shape similar to a Russian Kulich. This recipe for cheese babka uses the same sweet yeast-raised dough of a traditional babka with the addition of a subtle cheese filling that sinks to the bottom, which becomes the top! Three risings make this cheese babka, which is baked in a babka or fluted Bundt pan, a very light cake. The dough should be slack and pourable after rising. Ukrainians also feature babka for Easter, but instead of the fluted shape favored by the Poles, theirs looks more like a Russian kulich – tall and cylindrical. Kulich is a cross between a bread and a cake with a slightly sweet crumb. As with most foods, the recipe varies from family to family. But it usually has raisins, nuts and candied citrus rind. You'll need a 2-pound coffee can or kulich pan to bake it in. This chocolate babka recipe was appropriated from the Poles by Eastern European or Ashkenazic Jews. But it depends on who you talk to. Ashkenazic Jews claim the Poles stole it from them! As with most recipes, changes were made over the years. Instead of being baked in a swirly babka pan the Poles use, most Jewish people bake it in a loaf pan and, often, add a streusel topping. It's a delicious, rich version that may even surpass most Polish babkas. Jewish cinnamon babka differs from the chocolate version only in the filling. This recipe makes three loaves but they freeze very well. This cheese babka recipe is one of my favorites. This recipe makes three loaves but they freeze very well. Freeze leftover egg whites and save for leftover egg white recipes.